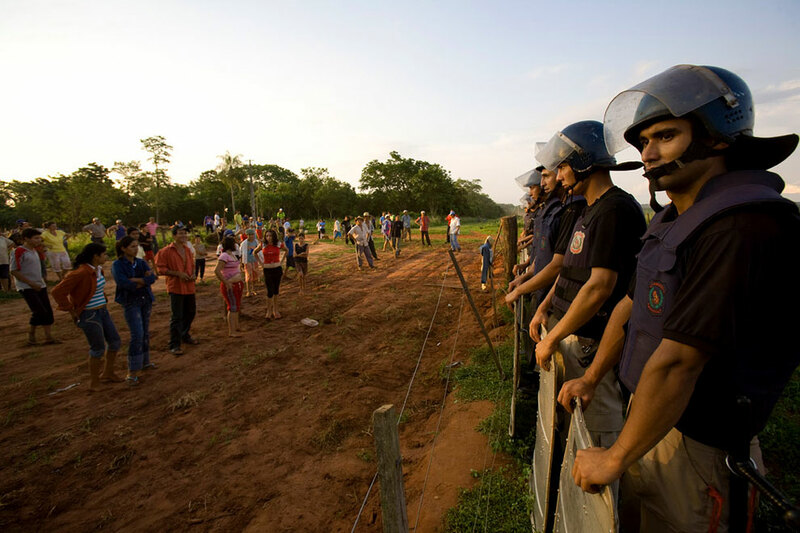 San Marcos, San Vicente district, San Pedro--October 27, 2008--National police stand guard at the edge of a Brazilian-owned genetically modified soybean farm, after a court-ordered eviction of a landless farmers' settlement on the edge of the property. Peasant farmers’ demands for land have increased since a soy-farming boom gathered pace five years ago in Paraguay. A wave of land takeovers is sweeping the nation, putting the $600 million dollar transnational soy industry in Paraguay at risk, which represents more than 30 percent of total exports for the country. Soy production has increased exponentially in recent years due to rising demand worldwide for meat and cattle feed, and the booming biodiesel industry. Industrial soy is directed toward these markets. Most of the soybean producers are Brazilian and Argentinian who moved to Paraguay in the last 10-15 years. Of the current 600,000 soybean producers in Paraguay, only 24% are Paraguayan.